Artificial AC mains are special devices for conversion of AC voltage of specified frequency and voltage to another frequency and voltage. Most often it is the conversion from 230/400V 50Hz to 110V 60Hz. This device serves as voltage and frequency converter. The specific artificial mains is custom designed to satisfy the individual requirements, with virtually no power restrictions. Basically there are two design principles: customer enters the required parameters and the power of an artificial mains, or electrical parameters and power are designed by VONSCH engineers for specific device parameters (e.g. number and types of motors or any other electrical equipment). All components are mounted in the enclosure with all the necessary electrical equipment and signalization. Product called "ARTIFICIAL AC mains" is offered for manufacturers of electronic devices, which are being exported to countries with other parameters of electrical grid. VONSCH Artificial AC mains is a voltage generator with a frequency of 60 Hz (or different), which is used for developing and testing the products under any supply conditions. 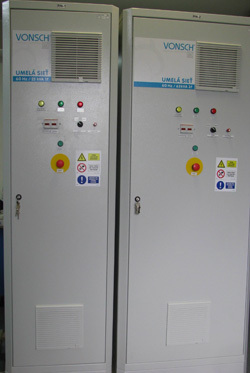 The artificial mains is based on VONSCH power electronics. 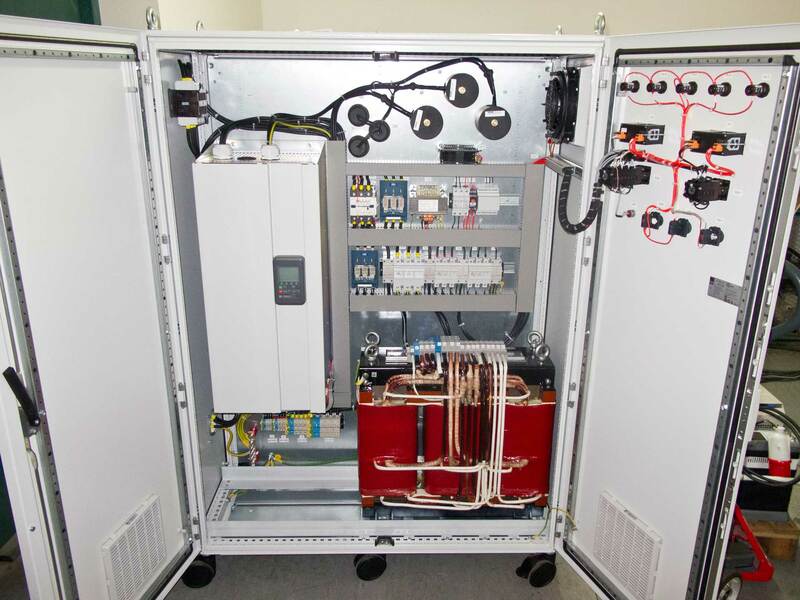 The artificial AC mains can be supplied by an European standard grid 3 x 400 V, 50 Hz. Its output voltage is adjustable to the range required by the accepted standards dealing with the grid voltage fluctuations. 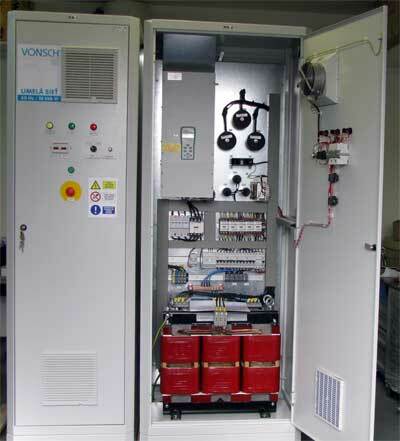 Output voltage is monitored by appropriate sensors, which are involved as a feedback control circuit of the output voltage, so the output voltage reference is followed regardless of the load value. Output frequency 60 Hz is also adjustable in the range of the required tolerances. Quite often we address the requirements for "inverse" Artificial mains, for the ability to run equipment designed and produced in countries with 230/400V 50Hz grid conditions in other countries using other standard of mains voltage and frequency, for example 60Hz network in the Americas. Typical application is the operation of the European machinery or other equipment in the US and Canada. VONSCH Artificial AC mains are suitable for replacement of older rotational converters and generators, which are close to their lifespan and their maintenance is costly and problematic. Artificial mains can be designed for any other frequency as well, e.g. 400 Hz for testing aviation or military equipment.